Could it be “Longing for Africa” ? We open the description of our last African adventure with this question in mind. A question to ourselves, after six years of traveling across this beautiful continent as members of the Italian DXpedition Team. In earnest, we considered planning our activities also for other destinations, but up to now the gratifications we received from our past experiences, including their humanitarian side, make us quite reluctant to pull out from Africa…. Anyway we shall try, promise! We had already considered Chad, or Tchad, in French, as a possible destination about two years ago. The reason for our hesitation was mainly due to costs, the expenses being considerably higher than what we were used to in our DXpeditions to other countries in the region. In addition, we could not secure adequate local support and logistics (electric power, internet connectivity, convenient space for antennas, and so on).All this until last spring, when, following the activity of Elvira IV3FSG as TT8ES in March 2012, we realized that time had come for considering again a serious commitment to a DXpedition to Chad.Just as Elvira returned to Italy we got in touch with her, and our original beliefs were confirmed. Even a limited appearance of TT8ES on the bands, with sporadic activity mostly on the digital modes (she was in Chad for humanitarian reasons), had produced a sweeping demand for a new one (be it all-time, or mode and band), in particular from USA and Japan. Detailed inquiries showed Chad to rank in a highly interesting position for the US West Coast and Japan, although not as much for Europe. Our final QSO statistics clearly denies this limited assumption. Having taken our decision, and being aware of the typical African pace, we began already in March the usual course of action: license, location, transports and logistics. As everybody knows, the most difficult step is obtaining the license. Luckily, Elvira put us in touch with Karmel, a nice young man who studied in Italy, born in N’Djamena, the capital of Chad, and now living there. He gladly agreed to negotiate on our behalf with the appropriatelocal Ministry. We were surprised to get all paperwork, license and callsigns, within a few weeks, just the time needed to exchange emails with our personal data, to send copies of our licenses and to transfer the money required for the authorizations. All of us got a Chad callsign, but for the convenience of a unique log we decided to use only one of them, TT8TT which had an attractive “sound” on both SSB and CW.Around mid-April, with a license valid for a full year, all the remaining organization chores looked like child’s game…but we did not take into account Africa!We started by searching, also with Karmel’s help, for an appropriate location. 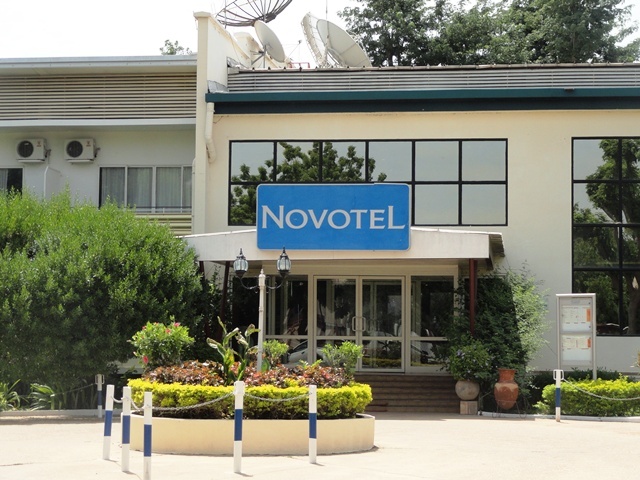 The only suitable venue turns out to be the N’Djamena Novotel. It is located in a quiet city district, with electric power and internet access, security personnel 24/24, a wide garden and a nice swimming pool. With an average daily temperature of 40 degrees C we enjoyed it a lot!We believed we could strike a bargain on the hotel rates, quite expensive on the standards of an African country, but we met an uncompromising attitude. In spite of explanations and reduced requirements on our side, we barely got a minimal discount, just sufficient for the few bottles of mineral water that we used during the installation of our antennas. In this type of hotels, the rates are strictly defined by the centralized administration (Novotel belongs to the Accord chain), and the manager has hardly any room for negotiating prices. After giving some consideration to giving up the DXpedition, in a brief meeting we decided to proceed. Unfortunately, Gino IK2RZP could not join us because of working commitments, and Alfeo I1HJT had to shorten his stay by a couple of days for similar problems. In the end we reached areasonable compromise and planned for the beginning of October. As this happened in April, just before our DXpedition to Somalia, we believed that we had sufficient time for our subsequent planning. But, as just said, we overlooked Africa.No point here to list the hundreds of emails between us, Karmel and the Novotel staff, detailing all aspects and motivations of our activities. Suffice it to say that we finally managed to get the final reservations only two weeks before the departure date, that is 6 months after the initial steps! Following this, the only thing left was to confirm our Air France tickets, booked previously. Here another surprise:for a 24h delay the ticket fare increased by 200 Euros (each). We were left no choice, with a new understanding of the reason why so many others gave up on Chad. At this point, it was probably cheaper to set up a DXpedition to St. Barth in the Caribbean, but…do you remember that famous homesickness for Africa? So, with a lighter wallet, but in very high spirits, we arrive at the day of departure: Milano Linate airport, to Paris and then direct flight to N’Djamena. We are familiar with all of it, but at the check-in counter the lady stares wide-eyed at our 300 kg of electronic equipment! After a uneventful flight we land in N’Djamena at 22 hours local, on the 2nd of October 2012. Our friend Karmel is waiting for us, but may not enter to the custom area to help with formalities. We do not worry, since we have all the necessary paperwork, but….Africa is an unlimited source of surprises! A diligent official explains that we are authorized to transmit, but not to import our radios! In a long discussion with several customs officials, Alfeo, the only one of us speaking an acceptable French, meets serious difficulties. Not for a language barrier, but because of the inflexible attitude of our counterpart. Thanks to Stefano IK2HKT, discussing privately with the officer in charge, we finally get the green-light statement “vous pouvez aller avec la radio”. Stefano never revealed the content of that discussion. We are still puzzled by what might have been said, since he cannot speak French! We meet our friend Karmel, and after exchanging greetings we get on the bus for a 5-minute ride to our destination. There it looks like we are back in Europe: a structure with more than 100 rooms, mostly occupied by European businessmen. We feel a little embarrassed, everybody wears formal dresses and ties, whereas we sport T-shirts and shorts…but in the end we do not feel the need to refurbish our attires, in spite of the hotel atmosphere. manager shows up with a copy of our licenses, giving us permission to proceed. We start immediately, in an effort to recover the half-day lost in discussions. 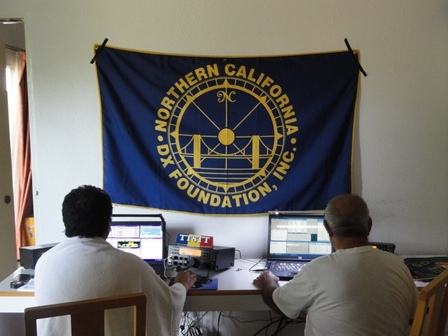 We first set up the SSB station and at 14:14 UTC on 3 October the first TT8TT CQ is on the air. We proceed with the RTTY and 6m stations. The CW station is postponed to the following morning, together with the low-band receiving antennas. Within 36 hours everything is operational and we can concentrate on our main job. The pileup was fierce since the very beginning, in spite of the propagation and solar index forecasts. A great surprise came from the activity on 6m: after our poor experience in Somalia we were somewhat hesitant, but after the first calls we realized that the TEP was helping. In the end we logged more than 2600 contacts on this band. We had excellent openings on the higher bands (10m to 20m), with signals persistently above S9 from Europe, USA and Japan, the latter regularly via long-path in the morning (we know very well by now the propagation in Africa and the path choice has become straightforward). We paid special attention to VKs and ZLs, with more than 120 single calls in the log, most of them on at least 3 different bands. The lower bands were a different issue, particularly on SSB. 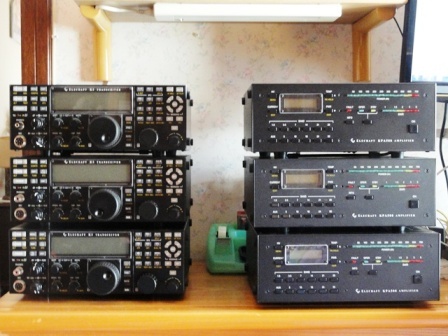 On 40m we believe that we could contact almost all the deserving on both CW and SSB, but we could not restrict the operation to just this band. During the night we had openings also on the higher bands, and we had to concentrate on 80m and 160m, which were new ones for most OMs in the world. We are rather satisfied of the CW 80m operation, whereas on SSB we suffered from heavy difficulties. 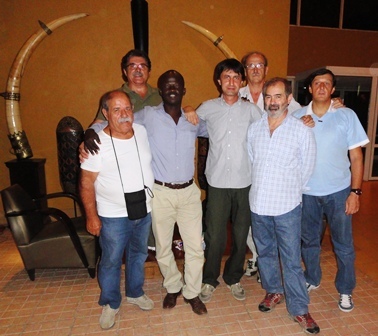 Time goes by quickly in a DXpedition, and our last weekend in Chad arrives. We do not compete for records, being well aware of the innumerable problems which can plague a DXpedition and its rosy expectations, but are we are also well aware that the larger the number of QSOs logged, the higher will be the satisfaction from this adventure. When, on Saturday morning, we realize that 63000 QSOs are in the log and less than 3 days are left, we aim at climbing the 70000 mark before the end of our activity. Stefano and Silvano give up lunch on Saturday and Sunday, Vinicio makes an extra effort on SSB, Angelo does similarly on CW, challenging his own endurance, Alfeo attacks his first experience in RTTY after only a two-minute training, and Marcello….well, Marcello enjoys the pool! The result of this “tour de force” is exhilarating: at 07:34 on 16 October we get above the 70000 level, and we keep going up to the 72000 mark. By this time, on Tuesday afternoon, the last QSO is logged, to our surprise on 6m SSB. The expedition ends on a remarkable opening on the Magic Band, which forces us to QRT sadly, having workable signals still present on the band. The plane will not wait for us, and we hastily dismount our equipment. In 3 hours everything is ready for loading. A quick dinner and we dash out to the airport. We say goodbye to our friend Karmel, get through customs and passport formalities, this time without hiccups, and on the evening of 16 October we take off, heading home. The following morning a sleepy stopover in Paris, time for a cappuccino and again airborne to Milano Linate. Here we are met by Piero, a friend who has become the official driver of our team. Back home for shower and rest, well deserved. After two days, in order to recover our daily routine and sense of reality, we get already on the phone with the usual mutual question: “Where do we go next, in March?”A little patience, and you will find out ! all the amateurs who, by voluntary individual contributions, help un in meeting the relevant expenses implied by a DXpedition. All of you are part of our team, and we trust that your continuing commitment will support us in the future. Thanks, and…see you soon !